MILWAUKEE, Wisc. – William Pelletier notched his 10th goal of the season just over 12 minutes into the third period to tie the contest and force overtime, but the Milwaukee Admirals skated to a 2-1 victory over the Rockford IceHogs behind Justin Kirkland’s shootout-winning tally at UW-Milwaukee Panther Arena Saturday night. Kirkland’s goal stood as the lone marker in the breakaway contest, as Harry Zolnierczyk and Frederick Gaudreau were denied for Milwaukee and the IceHogs’ Adam Clendening, Chris DiDomenico and Anthony Louis were turned away by Anders Lindback. Lindback starred throughout the game for the Admirals, but Pelletier managed to beat him on a 2-on-1 rush with a quick wrist shot past the netminder’s glove to knot the score at a goal apiece and send it to extra time. Pelletier has posted nine of his 10 goals on the road this year, and now ranks fourth among Rockford’s active roster with 23 points. Milwaukee earned the first lead of the game with Trevor Smith bagging his 13th goal of the year early in the middle frame, but Collin Delia stood tall through the final stanza and overtime to give his team a fighting chance. Delia stopped 15 of 16 Milwaukee shots on the night and has now helped the IceHogs pick up points in each of his last five starts (4-0-1). Lindback withstood 24 of 25 pucks in the opposite crease. 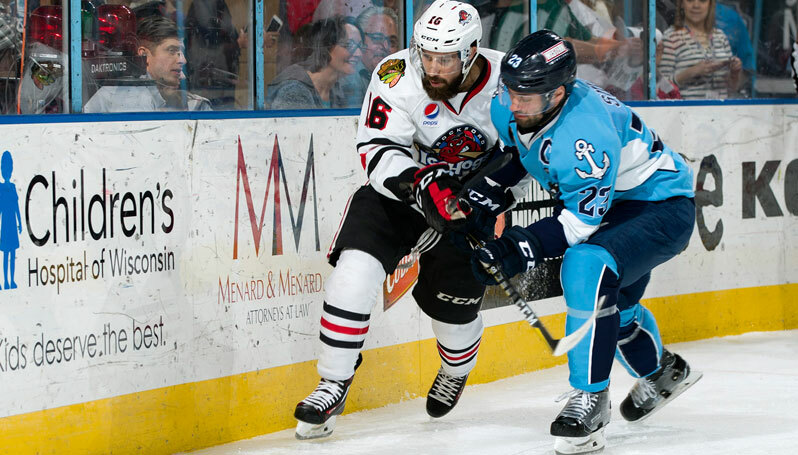 The IceHogs host the Iowa Wild at 7 p.m. at the BMO Harris Bank Center. Fans who attended Rockford’s victory against the Texas Stars on Feb. 28 can redeem their ticket stub from that game for a free ticket of equal or lesser value to the game against the Wild on March 13. Fans can also enjoy $2 tacos, select beer, and companion tickets as part of Taco Tuesday. Tickets can be purchased at IceHogs.com, by calling (815) 968-5222 or in-person at the BMO Harris Bank Center Box Office.